How the F did I manage to burn through 2000 text messages already this month? I thought that once I became single I could get away with dropping my plan from unlimited to say… a mere 2000. Well, that only worked for a while apparently. Am I one of those text messaging maniacs? Could I give the average millennial a run for his/her money. It doesn’t seem like I text a whole bunch, but as my texts are spread out to a wide range of people I guess it all adds up, especially considering the phone plan includes not just the ones I send, but also the ones I receive. Yesterday I got almost 30 texts from one ex-girlfriend. I did not send as many back, mostly due to time constraints. It’s not hard to see it as a metaphor for why things didn’t work out. She was too demanding, and I probably was too self involved and didn’t put in enough effort. Anyhow, am I really going to devote an entire entry to text messaging? Wouldn’t that be lame…. Back to Tony Curtis’ “American Prince.” The most intriguing chapter deals with his marriage to Christine Kaufman. 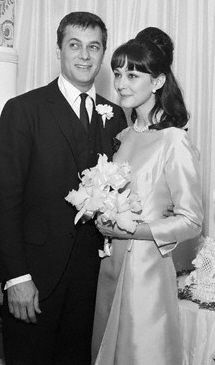 When he was aged 37, Tony Curtis fell in love with a young German actress named Christine Kaufman, who was only 17 or 18 at the time. He left Janet Leigh(he claims their marriage was over anyway) and promptly wedded Christine. Janet left Argentina, because she had a movie to make, but the reason for her leaving as quickly may have been jealousy of my beautiful young co-star, Christine Kaufman who played my love interest in “Taras Bulba,” a Ukrainian version of Romeo and Juliet. What no one knew at the time was that I didn’t need to act in my love scenes with Christine, because I really did fall in love with her. To make the situation even more ticklish…Christine was only 17 years old. That gave me pause, but there was a freshness about her, an exuberant joy in living that made me go all funny inside. Christine made life fun again, and I wanted to be with her in the worst way. My dream came true when we launched into a torrid affair for the first three weeks of shooting. Previous Article The game was created to demonstrate the futility of individual effort.